I woke up at 8:00 after a pretty good night’s sleep. It had been warm all night, with a steady wind from the lake that seemed to keep the mosquitoes at bay both last night and this morning. My agenda before leaving the campground was just to pack my backpack for the trip. When I quickly planned this trip at home, I collected everything I would need in a large storage box and put it in the back of my car. This morning I made coffee, re-packed the tent, and laid all of my gear out on the picnic table, making sure I had everything I needed one more time before packing my old REI Venus backpack. I was also bringing a day pack for shorter jaunts. That done, I left McLain State Park around 9:30 and headed back toward Houghton. 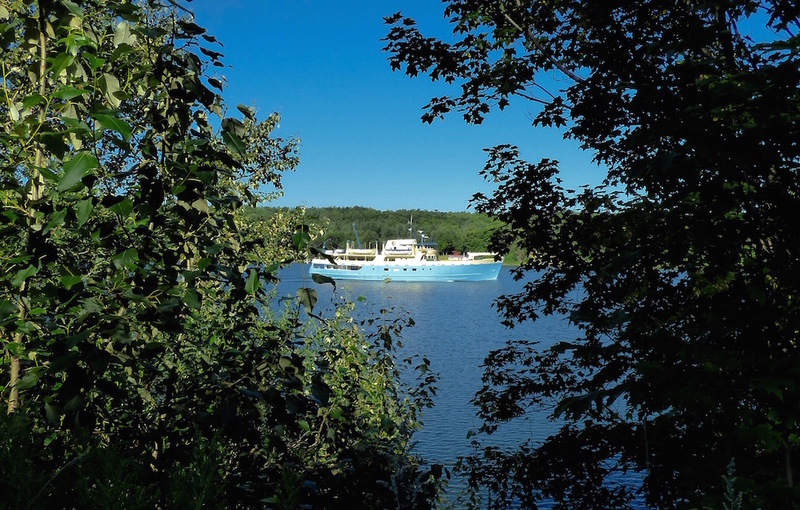 The drive along the Portage Canal is scenic, with a steep hillside rising up on the north side of the road, a steep slope to the water to the south, with houses tucked in the hillside between the road and water, and a tree canopy shading the road. At one point I pulled off to the side to photograph a particularly picturesque view of the canal through a window in the trees. I raised my camera and focused on the waterway and was immediately photo-bombed by the Ranger III, suddenly cruising into the window I was attempting to shoot through. 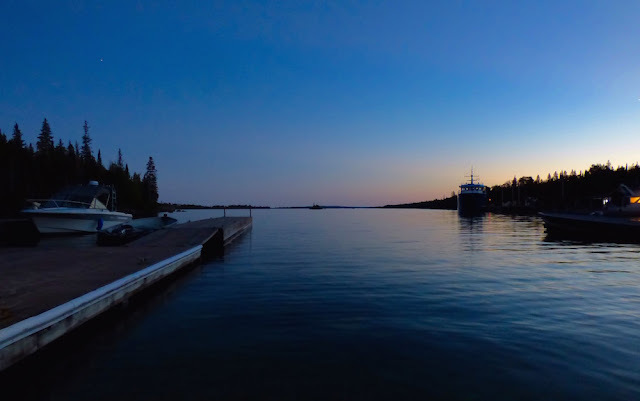 The huge boat was making its way west through the canal and out to Lake Superior on its six-hour trip to Isle Royale, loaded with park visitors. 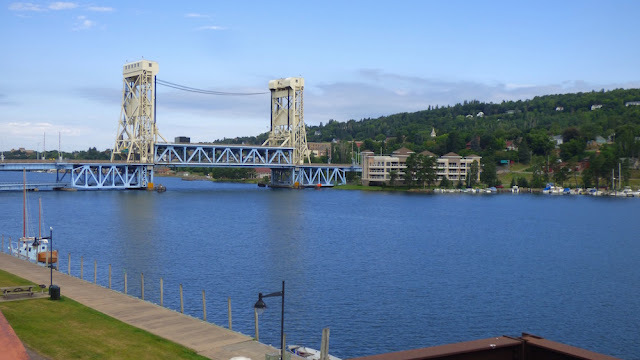 I crossed the bridge and returned to downtown Houghton, where I stopped at 5th and Elm Coffee House and enjoyed a bagel sandwich and coffee on the patio. After that I visited Downwind Sports to see if they carried inflatable pillows similar to the one that had just self-destructed. They did not, but I bought some wool socks because I had decided earlier in the morning that I didn’t like the selection I brought with me. I bummed around town for a while, eventually stopping at Keweenaw Brewing Company for a Pick Axe Blonde and some last-minute gear arranging. I drove north to the Houghton County Memorial Airport, arriving around 1:15 pm and heading to the Isle Royale Seaplanes “gate” area to “check in” for my 2:00 pm flight. The “” are because this experience is very casual. I set my backpack down next to a chair in the deserted seating area and the woman working at the desk said hello. She asked if I was on the 2:00 flight and I said yes and gave her my name. She looked at a piece of paper and said, “ok.” I was all set. Eventually another passenger showed up—a lone 35-40-ish year-old man carrying a backpack and two small duffel bags, one of which was very worn, barely holding itself together by its frayed nylon threads. He was being met at Tobin Harbor by family members who had a boat, which sounded like a pretty fancy situation to me. 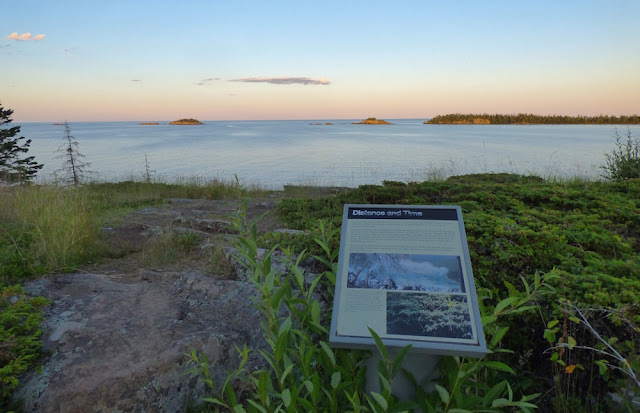 He told a funny story about how he had the same ancient duffel bag with him the first time he went to Isle Royale, which was via the Ranger III, and everyone was treating him like he was surely going to die within his first 12 hours in the park. “I’m just carrying this stuff onto a boat. I’m definitely not going to be roughing it,” he admitted. Neither was I for part of this trip, and I felt weird about it. 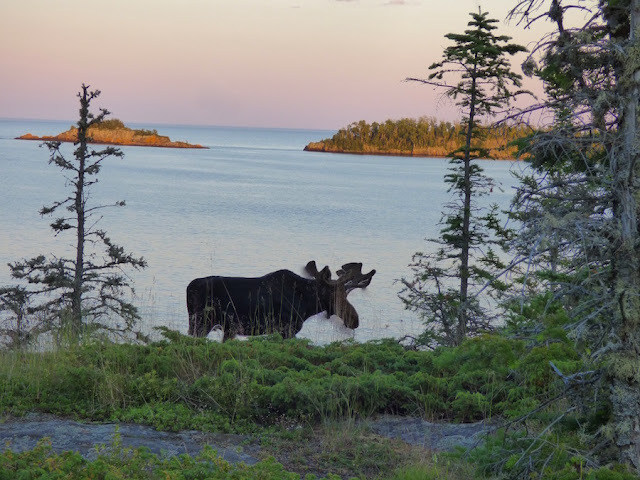 Isle Royale is such a sacred place for backcountry enthusiasts that is seems like sacrilege to deviate from a strictly backcountry agenda. 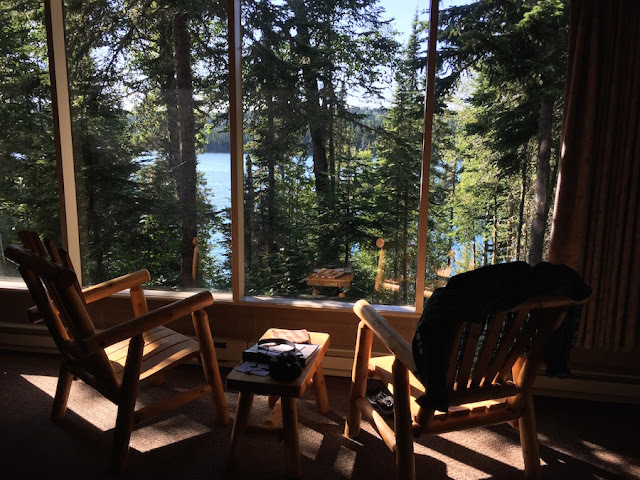 Staying in a cottage is not something I ever pictured myself doing there, and I struggled with strange guilt about it until I reminded myself that I was on vacation and it was not a crime to check out something different. The plane was running a bit behind schedule, and we didn’t leave until 2:30. There were just two passengers on this flight, and I sat up front with the pilot. The three of us chatted about various adventury things for a while, then eventually fell silent and just stared out the windows. The flight was perfect—clear blue sky above, calm blue water below, and we spotted the Isle Royale Queen on its way back to Copper Harbor, looking very small on the immense lake. Eventually the island came into view, with smaller islands dotting the outer reaches of the archipelago appearing emerald green against the deep blue water. It looked beautiful and exotic. 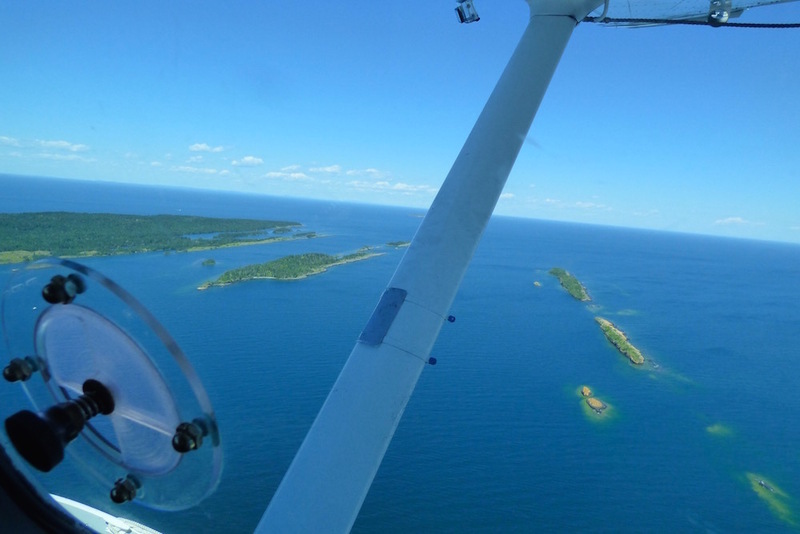 The pilot maneuvered the plane around in order to fly over the length of Tobin Harbor, where we landed softly and cruised around a few islands on the way to the dock. The flight took about 35 minutes. For 2 short videos of landing in Tobin Harbor, go here and here. 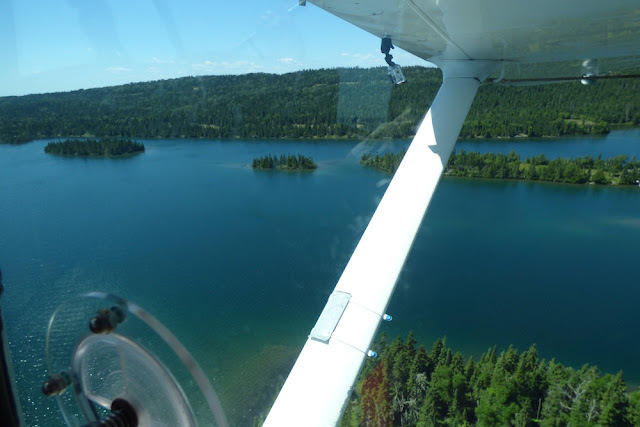 Unlike when we flew into Windigo a few years ago, there was no park ranger at the dock to greet us. We exited the plane, grabbed our gear and thanked the pilot before going our separate ways. My fellow passenger’s ride was docked about 20 feet away, a large fishing/cruiser type boat. (I don’t know anything about boats, but it looked posh.) Four people were waiting to catch the plane off the island, and they had clearly had a great time. We wished each other well as we passed on the dock, then I was basically alone. The Tobin Harbor entrance was like the Wild West—there was no one here to shepherd me to backcountry registration or talk about Leave-No-Trace principles. 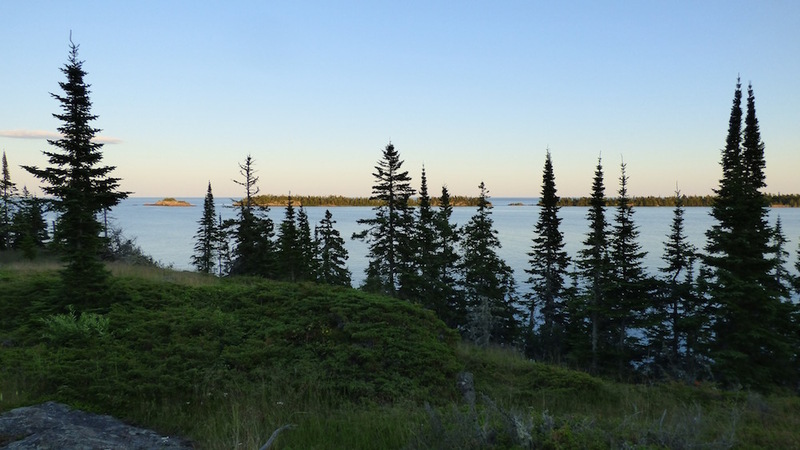 I looked around at the harbor, small islands, and beached canoes before heading up the path toward the visitor center, it suddenly hitting me where I was. I couldn’t stop smiling. I walked up the dirt path from the dock, passing a few cottages along the way. This was my first up-close view of them; they are of simple mid-century design—brown rectangles with angled roofs and large panels of windows facing Tobin Harbor—and look as though they probably haven’t changed since they were built. Eventually the trail joined the main network of paths that snake into the woods from the visitor center. Dirt turned to pavement as I closed in on the hub of activity that is the visitor center/camp store/marina/ferry dock area. The sun was blazing down from the cloudless sky, and it was hot. The Ranger III was resting at the dock after having ferried a batch of visitors earlier in the day, and a variety of people were hanging around—exhausted-looking backpackers at the end of their trips, new arrivals who were currently clean and shiny but would soon enough find themselves back here looking equally exhausted, and other visitors who were there to explore the island by canoe or kayak, go fishing, or stay at the Rock Harbor Lodge and take its boat tours. 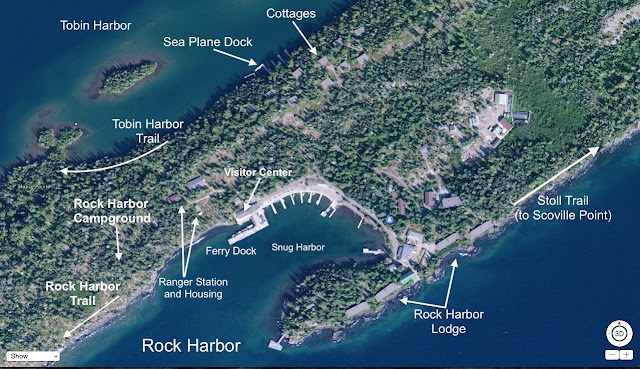 I walked to the lodge to pick up my cottage key, then returned the way I had come, walking back toward the Tobin Harbor sea plane dock, but branching off north and past a spot that I recognized from my first trip. It was from this path that I watched a female moose and her two calves as they crossed a clearing and entered the woods. I remembered the mother stopping to look back at me for a moment to make sure I wasn’t following them before continuing into the trees. I arrived at my cottage after a few minutes and was happy to discover that it had a nice view of Tobin Harbor. The cottages are duplex units; there are 10 buildings laid out in two rows—the first with front row seats to the harbor, and the second row behind them, but staggered in such a way that they probably also have at least a glimpse of water. The cottage has a kitchenette with stove, oven, mini fridge, and cabinets stocked with cookware. There is a table with four chairs for eating/card playing/activity strategizing, and two Adirondack type chairs in front of the harbor-facing windows, which take up most of that wall. Some cottages have a set of bunk beds in addition to a full-size bed; however, this one just had the one “full-size,” which was a bit small and would not be very comfortable for two adults. 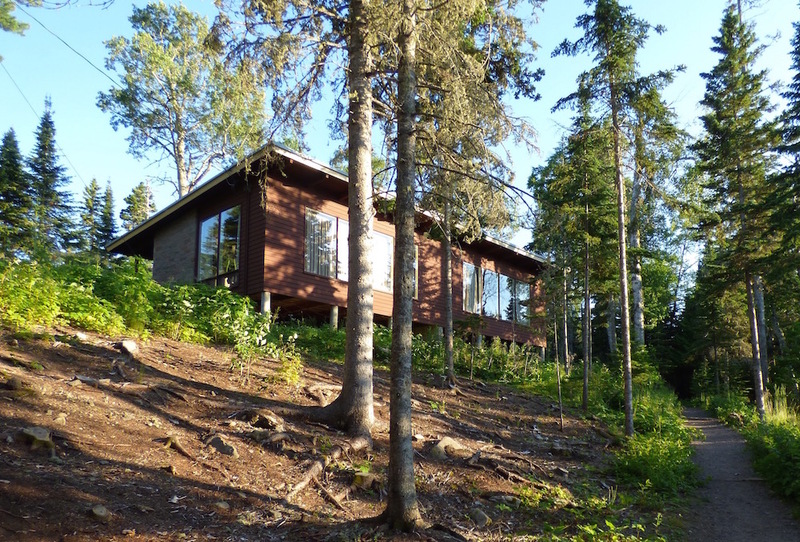 (I got the impression that this cottage was used for single-occupancy reservations.) It had a large but no-frills bathroom, with tub/shower combo, and changing area. All in all I was very happy with the accommodations. My only gripe was that it appeared I was in the only cottage that did not have a screen door, so I wasn’t able to leave my door open for extra air flow. However, I didn’t plan on spending a lot of time inside, so it wasn’t a big deal. Time flew by as I settled in to the cottage, took a stroll around the immediate area, and visited the lodge office to verify my water taxi reservations. A retro-style poster in the office warns of moose aggression and reminds people to give them space. I wondered how quickly things will change in this park with the moose numbers rising due to the disappearance of the island’s wolves. At last count, there were just two remaining, and the National Park Service has been weighing its options regarding the loss of this park's crucial predator. Soon it was getting near dusk. It was a beautiful evening, warm and clear-skied, and I decided tonight was as good as any time to tackle my first goal of this trip—hike Stoll Trail out to Scoville Point. I threw a few items into my day pack—water, a variety of insect repellant (I hate mosquitoes, but I don’t like to use bug spray unless absolutely necessary, and I try to use those with natural ingredients before going for deet, but I keep both on-hand), camera, headlamp, head net, and my rain jacket and first aid kit just in case. 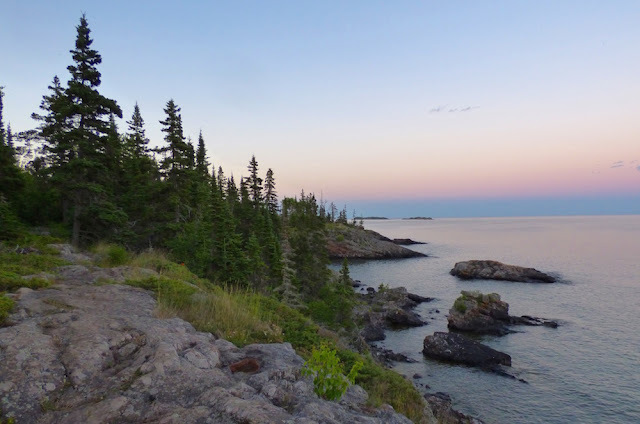 Stoll Trail is 4.2 miles round-trip and can be hiked in a loop, with one half hugging the Lake Superior shore/cliff edge, then looping around to take an inland path near Tobin Harbor on the way back. I planned to hike out and back along the lakeshore instead of doing the loop so I could enjoy the rugged shoreline in both directions and have a bit more light on the way back since I would be returning after sunset. It was 8:40 pm when I set out on the trail, thinking I would arrive at the point in about an hour, right as the sun was going down. I should have known that I would get distracted and take longer than that. 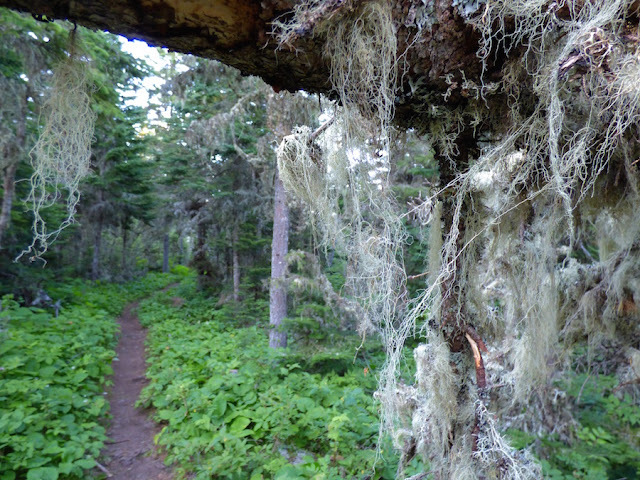 Rugged and rocky, the trail travels at first through thick spruce forest, with lichen hanging from branches, and the forest floor thick with thimbleberry and other plants. Mosquitoes were an immediate problem, and it wasn’t long before I abandoned the lemon eucalyptus spray and went for the hard stuff. However, the mosquitoes were not impressed with any of it, not even 100% deet. They weren’t swarming to the point where I needed my head net, and I knew that once the trail emerged into more open territory it wouldn’t be so bad, so I just tried to hurry through the dense forest. For a video of a scene from Stoll Trail, go here. 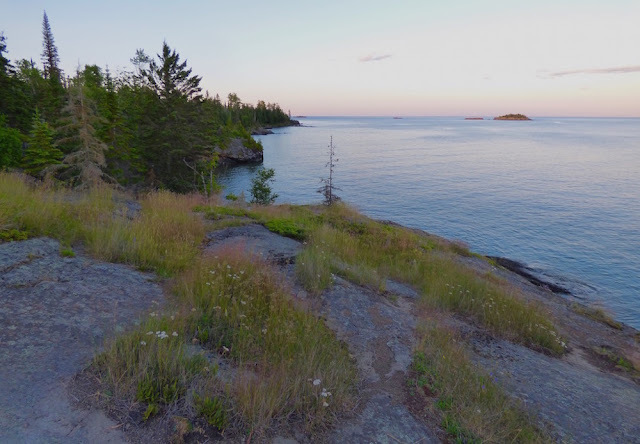 The forest eventually thins, and the trail begins breaking out onto a series of rocky crests, with views of Lake Superior and the small islands to the south. Interesting interpretive signs placed here and there provide history and tell geological stories. I lingered for a long time at these spots; aside from the mosquitoes, it was a perfect night, and the scene was just as I had imagined it would be out on this rocky trail: the setting sun was casting the rugged, sloping rock in soft light and bringing out intense shades of orange on the little rocky islands. Amazingly, I hadn’t seen a single other person out on this trail despite the beautiful night. I was certain other hikers or lodge guests would be out here taking in the gorgeous views, but it appeared I was completely alone. After spending a bit too much time gazing at the scenery from a makeshift log bench on the edge of an especially picturesque section of cliff, I returned to the trail, which curved behind some trees before once again rising over a crest and providing another open view of the lake. I came over this crest and found myself staring at a gigantic bull moose—way too close. I stopped dead in my tracks. 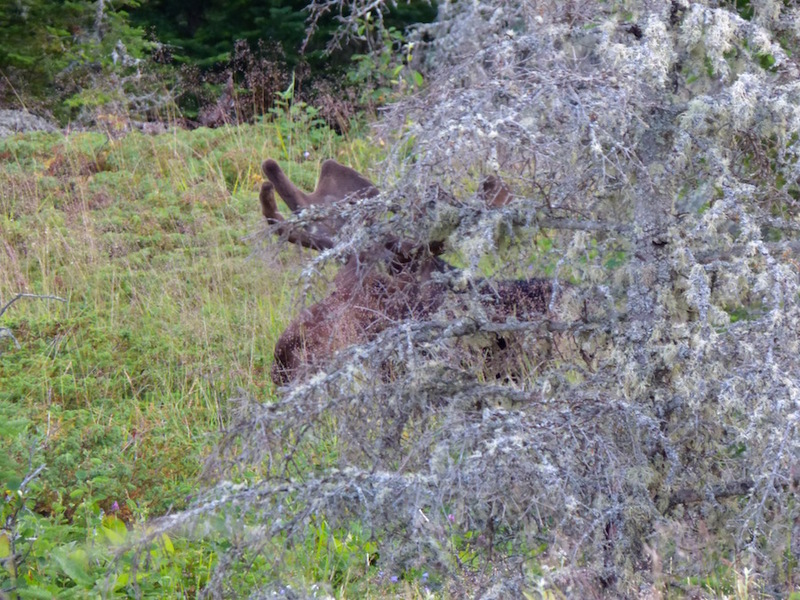 The moose also appeared to have stopped abruptly; it had been walking along the edge of the ridge in my direction, and when I popped out as the trail crested a hill, I startled it. My immediate thought was that I was looking at a cardboard cut-out or one of those black silhouettes that people put in their yard—like the cowboy lounging against a tree. This obviously made no sense, but the scene looked entirely fake, like an idyllic advertisement for the National Park Service. (In fact, almost exactly like this new poster that I saw for sale at the visitor center. Also, I have a birthday coming up.) The moose stood still and alert, staring at me. My heart was beating against the back of my throat. I backed off the trail and waited. After a few tense seconds, it turned its huge head away from me and back forward and continued walking. I took a couple of quick photos, and then waited some more. The problem was that he was walking a parallel path to me, going in the opposite direction, and we were still in clear view of one another. If I turned around and headed back, it would be behind me heading in the same direction, and I didn’t really want to hike back with a gigantic moose behind me. I waited until it walked a bit further, then I slowly stepped back onto the trail. It stopped again and so did I. I was sweating. Unlike the times I encountered wolves in this park, I was scared. I didn’t know what the moose was going to do. I assessed my situation and did not like it. There were no substantial trees nearby to get behind if it decided I was unacceptable and charged. I tried to think of what I could do, and came up with nothing that didn’t involve me getting my face sliced open with a hoof. It faced forward again and continued walking slowly. I took that opportunity to quickly put some distance between us, speed-walking down the trail in the opposite direction and then stopping again to watch it from afar. It was now cutting a path away from the water and toward the trail where I had been walking. 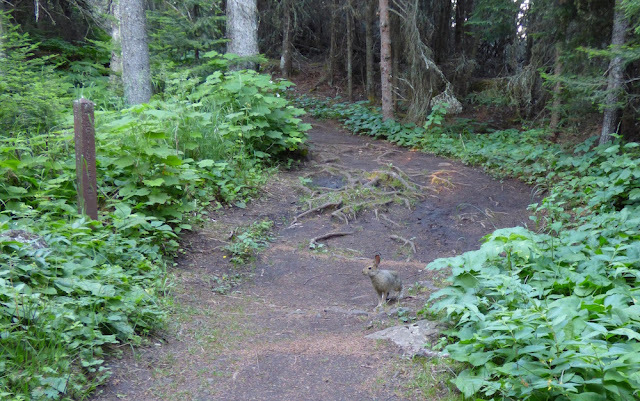 It lingered behind a couple of dead spruce trees for a few minutes, then turned in a circle, and abruptly settled down with an audible “thump” right next to the trail. So...I wasn’t going back that way then. I continued toward the point, but my mind started to wander to bad places. I had lingered longer than planned in a few spots and it was now getting dark fast. The mosquitoes were becoming relentless. Since I couldn’t return the way I had come due to moose interference, I would have to do the loop after all, hiking in the dense woods further inland on the way back. This was fine—I had brought my headlamp—but what if there was another moose on the trail and I was cut off going that way too? I really, really didn’t want to startle another one in the dark. At this point, they were all going to be hunkering down for the night—were more of them laying down in the grass up ahead? Would I be trapped and forced to hunker down out here myself? Was this scenario far-fetched? Maybe, but alone in the near-dark and getting eaten alive by mosquitoes, the self-doubt was maddening. I thought: This is how people end up in news articles, being judged by others for their stupidity in the comments section. The situation had all the classic elements: I was alone. (Why weren’t any other hikers out here? It was a beautiful night!) I hadn’t told anyone where I was going, and no one would notice if I didn’t come back, probably for a few days. (I was just going on a short, scenic hike! What could go wrong?) I was prepared with a first aid kit and rain jacket, but I hadn’t thought to prepare for an emergency overnight due to potential moose stand-off. (ABC: Always Be Considering...potential moose stand-off.) I was fewer than two miles from Rock Harbor, but I suddenly felt completely isolated. I decided that I needed to abort this mission and get back asap before it was completely dark. I could come out here again on another day and finish where I had left off. At about a half-mile from the point, I turned around and hightailed it back, hiking most of the trail by headlamp in the dark, while being relentlessly plagued by mosquitoes. (My notes state: "Have never sweated so much. Mosquitoes bad.") I was extremely relieved to find myself back at the harbor, where the blue hour was underway. Now out of the woods, the mosquitoes were no longer a nuisance, and I walked to the edge of the water at the marina, took my shoes off, dangled my feet into the water, and just sat there for 30 minutes or so, enjoying the scene. The water and sky glowed dark blue, and the only sound was the gentle lapping of the lake against the docks. The Ranger III was docked for an overnight stay, and everything was shut down for the night. There was just one other person that I noticed sitting on a nearby dock and enjoying a similar experience. I walked back to my cottage by headlamp and sat at the window for a while reading a book before turning in for the night. I heard common loons calling out on Tobin Harbor as I drifted off to sleep. Trip Goal #1: Scoville Point--Fail. Close Encounters of the Moose Kind! What a harrowing experience, I believed you when you said you were truly scared. I'm glad both you and the moose acted with the utmost respect! Aw man -- you can't *avoid* awesome animal encounters. I'm so envious, even though this one was kind of scary. 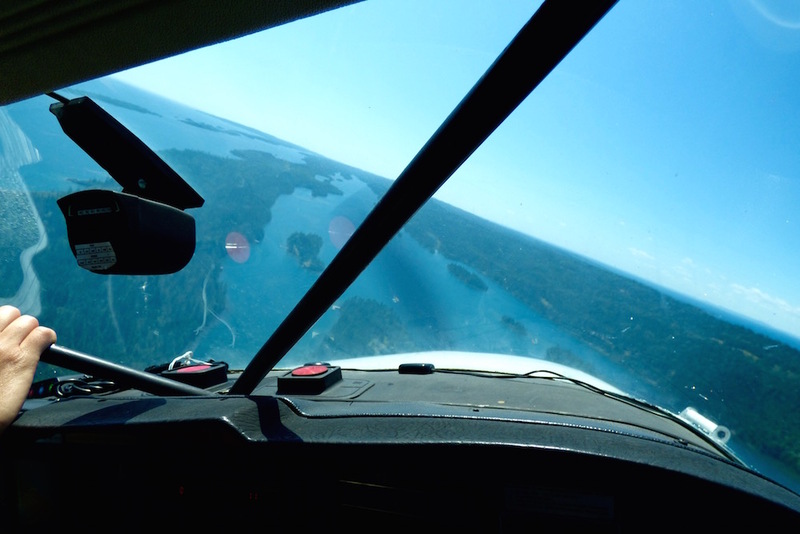 Also, that photo from inside the cabin just about instantly sold me on trying one. Just got back from my first trip Nina. Can see why this place calls out to you. We did a cabin. Had my 83 yo parents with us who did the Rock Harbor, Suzy's cave, Tobin Harbor loop, Lookout Louise and Scoville Point. That Bull might still be in that same area of the Stoll trail. Couple of people talked about being in the same situation you were. We saw the bulls in Rock Harbor but not the one on the point. Going to practice and try to fly solo with a pack next year. Your blog is indeed inspirational. Thanks, Joe. If you go back next year, let me know how it goes!